If spending $30 million to see your favorite NFL team play in your backyard is possible, practical even, then so is paying your debts. 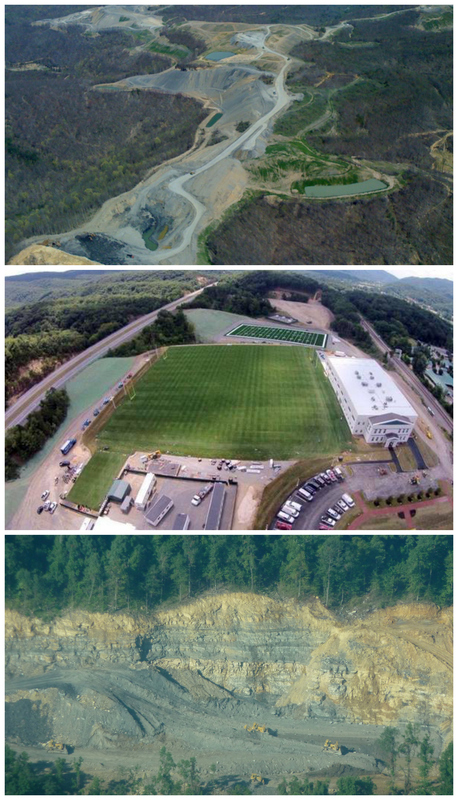 One of these things is not like the other, but they’re all owned by Jim Justice. Premium Coal’s Zeb Mountain (top) and Windrock Mountain mines in Tennessee, and the Greenbrier’s new training complex. Photos from tnleaf.org and Facebook. On July 25, as opponents of mountaintop removal celebrated an order that halted three companies’ surface mining operations in Tennessee, New Orleans Saints fans flocked to the Greenbrier Resort in White Sulphur Springs, W.Va., where the NFL football team began training camp at a brand new $30 million facility. At the center of both stories is Jim Justice, a billionaire West Virginia native who in recent years cut his coal losses by investing heavily in resort properties like the Greenbrier. The Sierra Club and Statewide Organizing for Community eMpowerment shared the news that the federal Office of Surface Mining Reclamation and Enforcement issued 39 cessation orders against National Coal, Premium Coal and S&H Mining, each owned by Justice, for failing to report water monitoring data and meet mine reclamation requirements. In fact, coal mines owned by Justice in Alabama, Kentucky, Tennessee, Virginia and West Virginia have racked up more than 250 violations, with unpaid penalties of about $2 million. Justice is worth somewhere in the neighborhood of $1.6 billion. Forbes magazine puts him at number 292 on a list of wealthiest Americans and estimates that his personal wealth has grown by $500 million in the last year. In some circles, he is revered for rescuing West Virginia’s historic Greenbrier Resort from bankruptcy in 2009. And even as violations against Justice-owned operations pile up, West Virginia’s lone billionaire is helping his state through troubled times. Photo from the Justice to Justice campaign’s Facebook page. Some folks in Kentucky feel differently, and understandably so — nearly half of the 266 violations Justice faces resulted from problems at mines in that state’s eastern counties. Along with violations for failing to pay fines or breaking promises after previous enforcement actions, the charges in Kentucky stem from companies failing to submit water monitoring reports and failing to meet reclamation requirements. The problem has gotten so bad that some states are considering bond forfeiture, a last resort that could push the costs of proper reclamation off on the communities Justice’s companies have already put in harm’s way. It’s not the first time his companies’ poor regulatory records have hurt their ability to do business. Outstanding violations in Virginia led to a massive victory for opponents of mountaintop removal last year when the Department of Mines, Minerals and Energy denied a permit for Justice’s A&G Coal Corp. to strip-mine Ison Rock Ridge in Wise County. But the recent cessation order in Tennessee represents the largest action to date taken against Justice’s companies. Unlike all the other states where his operations face violations and fines, Tennessee’s mining regulatory program is handled by the federal government. 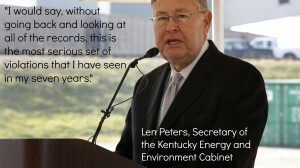 Before the cessation orders were issued, the federal Office of Surface Mining held public hearings in Anderson County, Tenn., to address Premium Coal’s failure to meet reclamation requirements at two mine sites. Premium Coal requested the orders be dropped because the crew they hired had planted trees upside down with the roots sticking up. 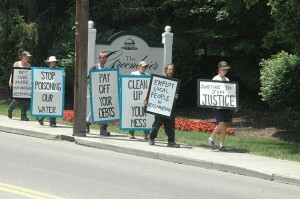 Southern Appalachian Mountain Stewards formed the Justice to Justice campaign to raise awareness about the dismal regulatory records and outstanding debts of Justice-owned coal companies. Photo from justicetojustice.com. Sadly, media coverage of Justice’s latest major investment has obscured everything mentioned so far in this post. A USA Today story about the new facility built for the New Orleans Saints praised a genial, sports-loving Justice, calling him a “refreshingly grounded billionaire.” Justice was proud to share the amount he spent to see the Saints come to the Greenbrier. The facility, which has variously been described as “posh,” “lavish,” and “state-of-the-art,” was built in about 100 days. You can watch the video at right from the Charleston Daily Mail’s YouTube account for a look inside. Yes, it is unbelievable, and exceedingly hard to not just conclude that Justice sees himself as being above the law. If dropping $30 million to see your favorite NFL team play in your backyard is possible, practical even, then so is abiding by surface mining laws and properly reclaiming mines — trees planted root-side down and all. Justice says the demands of his critics, who he calls “anti-mining activists,” are unrealistic. But considering the circumstances, a regional movement calling on his companies to clean up their mess, pay off their debts and stop poisoning water is not only realistic, it’s unavoidable. Justice practically created it. To do right by Appalachia, he should meet those demands and then some. And he could start by responding to the open letter and request for a meeting the Justice to Justice campaign sent him months ago. Appalachian Voices, Kentuckians for the Commonwealth, Statewide Organizing for Community eMpowerment and Coal River Mountain Watch recently signed on to Justice to Justice campaign. Learn more here and by liking the campaign’s Facebook page.